Greenrock provided details of this year’s Earth Hour Campaign, saying that the annual Earth Hour Celebrations will take place in Bermuda on Saturday, March 25th. “This year the event will be hosted at City Hall and the success of the initiative is largely due to the significant roles played by our partners BELCO, Corporation of Hamilton, Ministry of Public Works, Chamber of Commerce, WEDCO, Department of Energy, Bermuda Timing, Waterfront Properties, ACBDA, and the Earth Hour Council,” a spokesperson said. “The event will open at 7.00pm with live entertainment followed by vendors, face painting, BELCO bikes, electric vehicles, aerial performance demonstrations and speeches from representatives of the key organizations involved. “The main feature of the event is the 5K Glow Fun Walk & Run which will take place during Earth Hour at 8:30pm. Registration on racedayworld.com is open until Friday, March 24th for individuals, families, schools & corporate teams. Race Packet collection will take place from 12 noon – 2pm on Friday, March 24th at City Hall and same day registration will be available on March 25th from 6pm – 8pm at City Hall. “With assistance from the Corporation of Hamilton and Public Works, roads will be closed throughout the race course during Earth Hour and police officers will be positioned strategically to manage traffic flow at all intersecting roads. 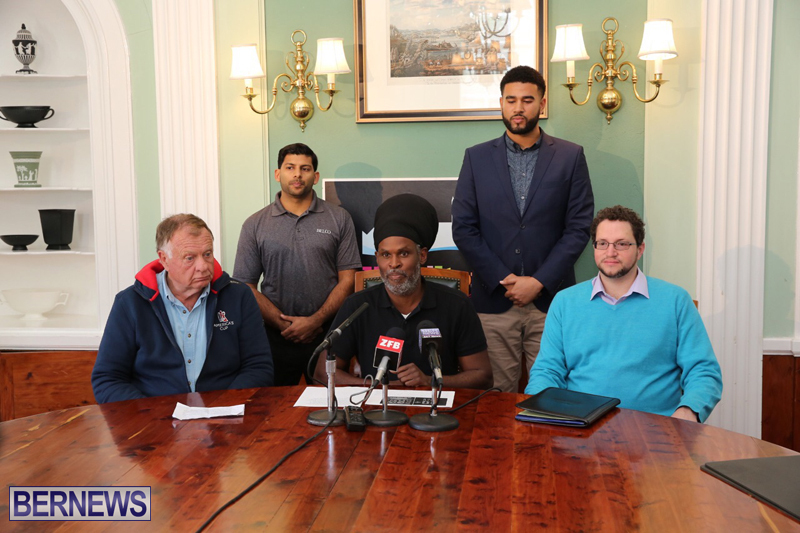 “Race marshals will also be positioned throughout the course to guide participants through the darkened streets so we ask the motoring public to be mindful of walkers, runners and road closures when driving through Hamilton this Saturday, between 8:00 pm and 9:30 pm. “Where possible, we recommend that anyone planning to be in Hamilton that evening come into the city before the road closures at 8pm and remain parked until Earth Hour concludes at 9:30 pm. Detailed plans of the race course, road closures and managed intersections are available on the registration website racedayworld.com. “To reduce waste, we encourage all participants to use reusable glow products to light themselves up during the race rather than single use products that will become waste after the event. “This year we have a selection of reusable glow products for sale on the registration website and our hope is that with these options we can reach our goal of making the 5K Glow Fun Walk & Run waste free. “As an alternative to bottled water, there will be a free water station at City Hall, so we encourage all participants to bring reusable water containers to the event. “We also ask that all participants be mindful of traffic while walking or running through the city. We will do our best to make the event as safe as possible and we ask that the general public do the same. “Greenrock is also proud to announce that we have expanded our reach into the west end of the island due to WEDCO’s involvement with the initiative. WEDCO Marketing & Events Manager Stephanie Rodill said, “West End Development Corporation is extremely happy to participate in Earth Hour 2017. This event brings awareness of the need to help protect our environment and we happy to do our part in lowering Bermuda’s carbon footprint. “We seem to be confronted almost daily with evidence of the way climate change is affecting the Earth and, here in Bermuda, we are not immune to the effects of those changes, so it is imperative that we all ‘do our bit’, however small, to help. “Earth Hour asks that you turn out your lights for one hour and that really is not a long time. But it is more than just the act of throwing the light switch, it shows that you are concerned for the future of your children and your children’s children who will inherit the environment. Hamilton Mayor Charles Gosling said, “The City is once again proud to lend its support to the Earth Hour initiatives in Bermuda as we help to bring awareness to the need to conserve power and do what we can, as responsible citizens, to reduce our carbon footprint. 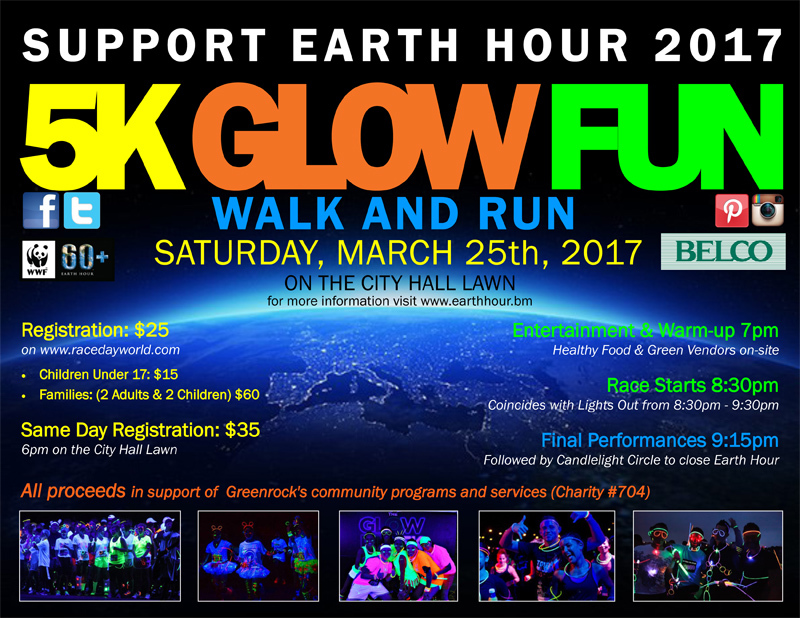 Greenrock added, “Funds raised for Earth Hour are used primarily to support Greenrock’s community projects and programs to help create a more sustainable Bermuda. This year we are asking participants to raise pledges in support of our programs and have partnered with ACBDA to provide America’s Cup prizes for the top three individual fundraisers, the school that raises the most pledges and the top corporate fundraising team. ACBDA CEO Mike Winfield said, “We applaud Greenrock for the work they do in educating the public in sustainable practices. You may know that America’s Cup and all of the participating teams have agreed a sustainability charter. Bermuda can be proud to have attracted an international sporting event that cares about its impact on the environment. Korrin Lightbourne of the Chamber of Commerce added, “This year, the Chamber of Commerce will participate by ‘going dark’ from 4:00pm – 5:00pm on Friday 24 March. We encourage all of our members and other businesses around the island to ‘go dark’ from 8:30pm – 9:30pm on Saturday 25 March, by turning off power in your buildings or simply darkening your windows in support of sustainability. Greenrock added, “Earth Hour is run primarily by volunteer effort and we are still in need of several volunteers for the following tasks: Race Marshalls, Race Packet Distribution & Same Day Registration. For more information, go to Earth Hour Bermuda on the racedayworld.com website and click on the volunteer link. It is a prideful thing indeed.